What the hell have these tools been doing for the last year? October 2017 an agreement was reached with good ole KIP (again) for the 4 acres of land for the water filtration system. 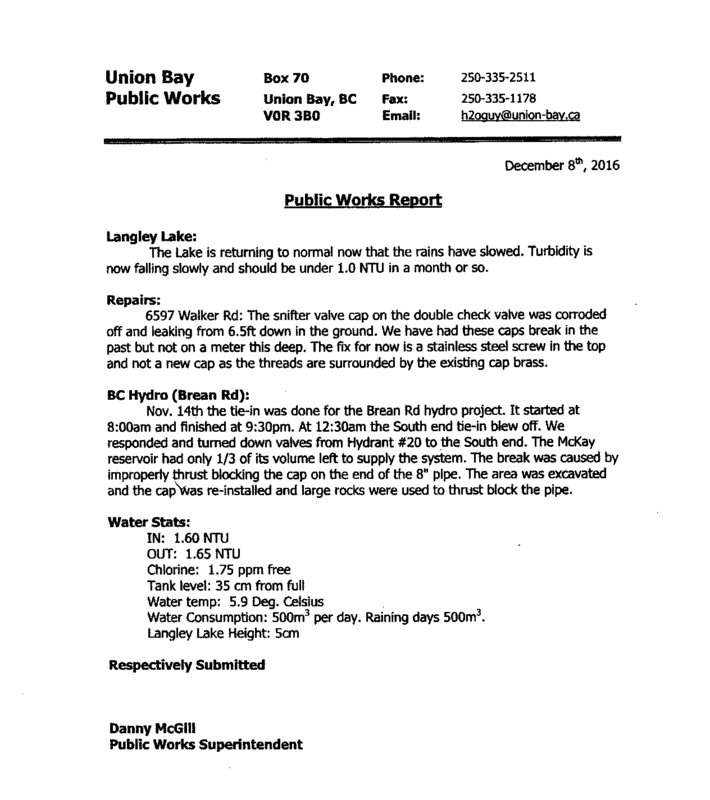 Not a mention of the water superintendent using an outdated turbidity tree for the last 5 YEARS! What a slimy bunch of spineless goofs. This meeting was 17 minutes. No correspondence? That’s not true and they know it. When people are that comfortable lying it’s a good indicator of their character as it comes so natural to them. The gutless wonders managing the safety of the water you consume. 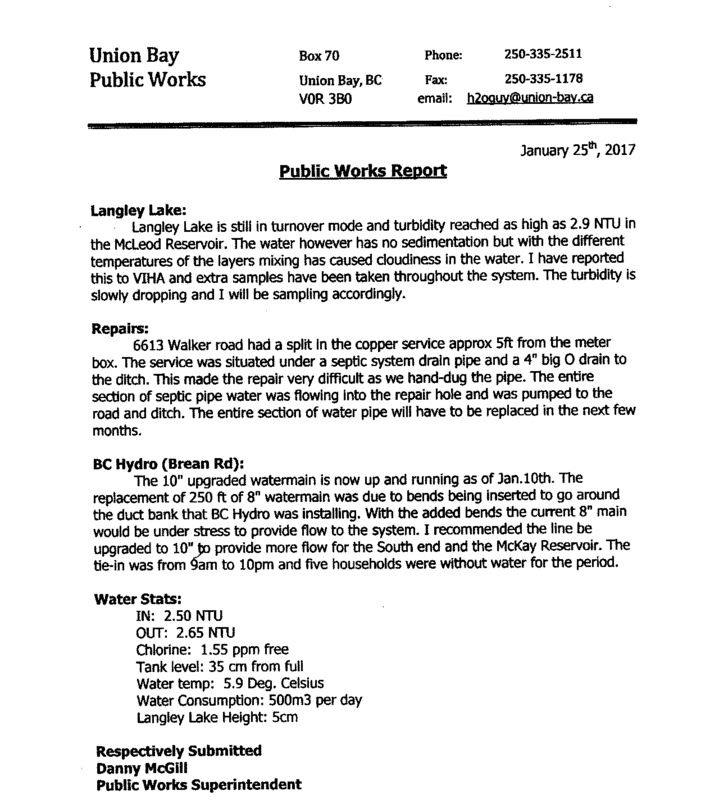 Trustee Kaljur brought this up at a public meeting and was told the water superintendent would provide information regarding the water testing. 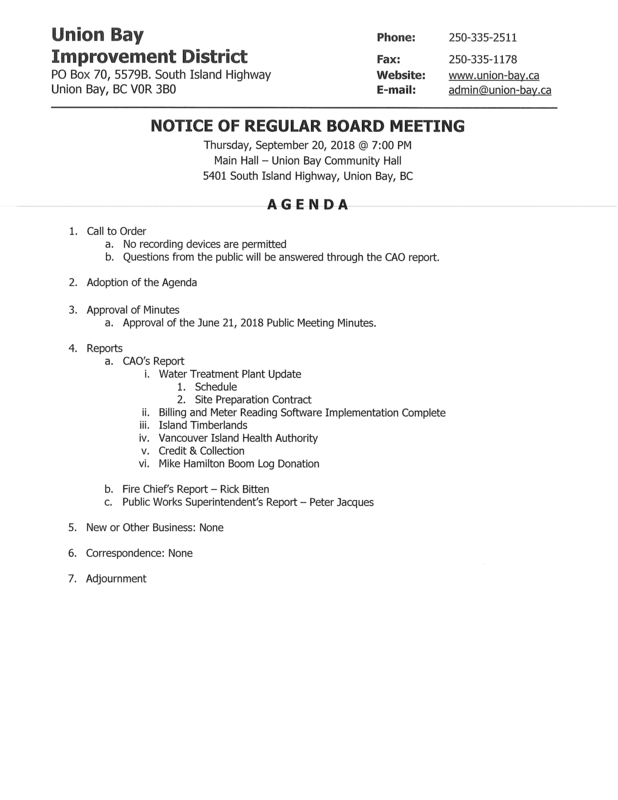 Well, that’s not on the agenda for the Sept. 20, 2018 meeting. The gutless wonders may as well tell everyone to go f*** themselves – they don’t answer to anyone now that they are elected. Remember, the Public is a distraction, that’s why they are doing everything in secret. 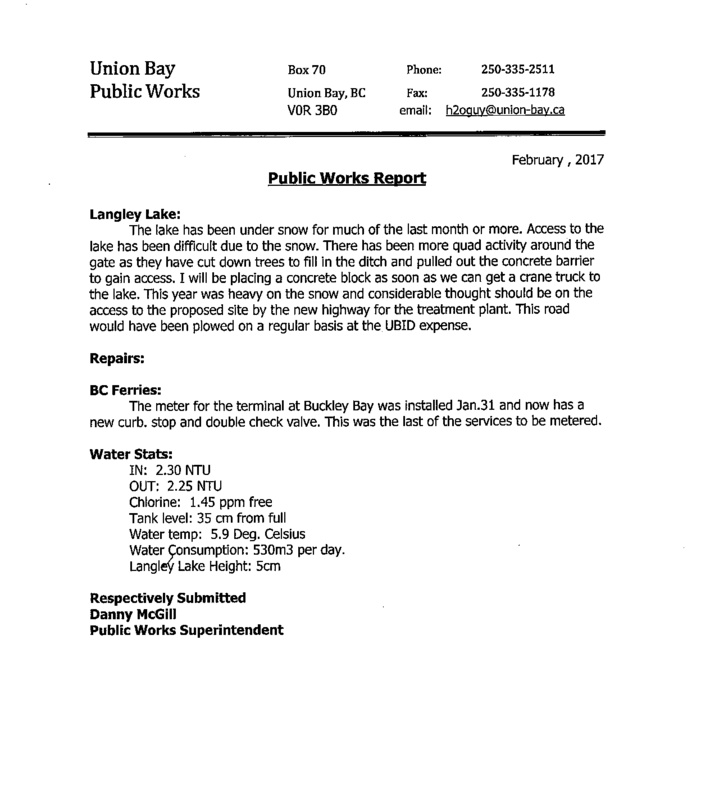 The Union Bay Improvement District’s main responsibility is to ensure safe potable water. Isn’t that what they have been telling us for the last year? How important it is to provide safe potable water for landowners. 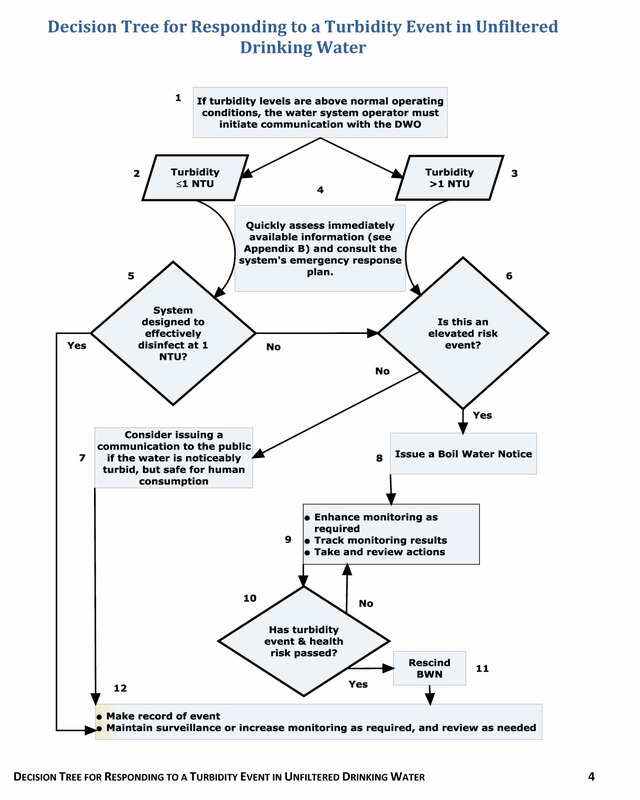 Then why has the water superintendent, who has been employed for years by UBID and sent on all kinds of courses to make sure he is knowledgable and can be trusted to ensure our water is safe to drink – using the Turbidity Tree that has been obsolete since 2013? In the last 5 years how many times should there have been a boil water advisory? 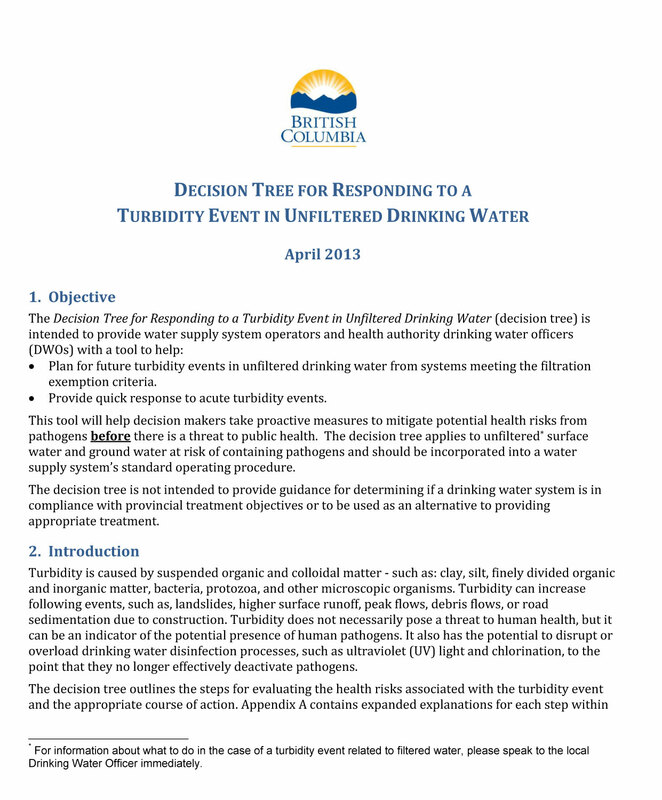 Here’s the 2013 Turbidity Tree that has been ignored. Here are just three months from this superintendent where the NTU’s exceed >1 Dec. 2016, Jan. 2017 and Feb. 2017. Most of us would be fine but it’s those with compromised immune systems that are at risk when bacteria attaches to particles in the water supply. Thought you had a touch of the flu? Union Bay stupid white folk struck again last night. 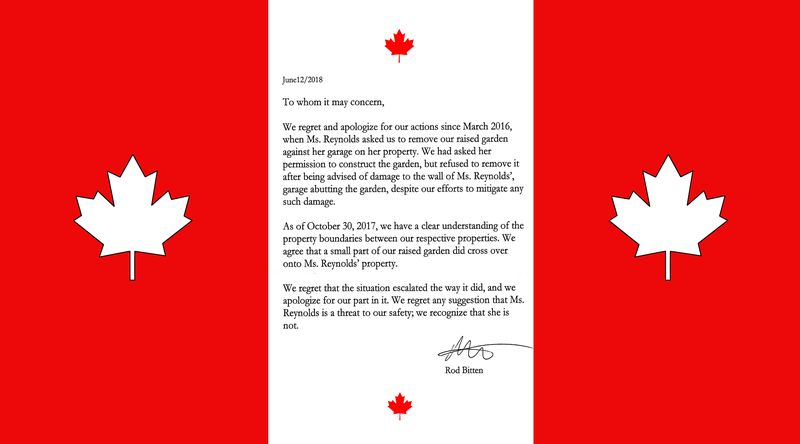 Gee, who could possibly be upset at my sign of Rodney Bitten’s apology? Hmm. Isn’t the apology genuine from Rodney Bitten, admitting and regretting what he did to me since March 2016? More than 2 years! Someone doesn’t want the truth out there – who could that be? 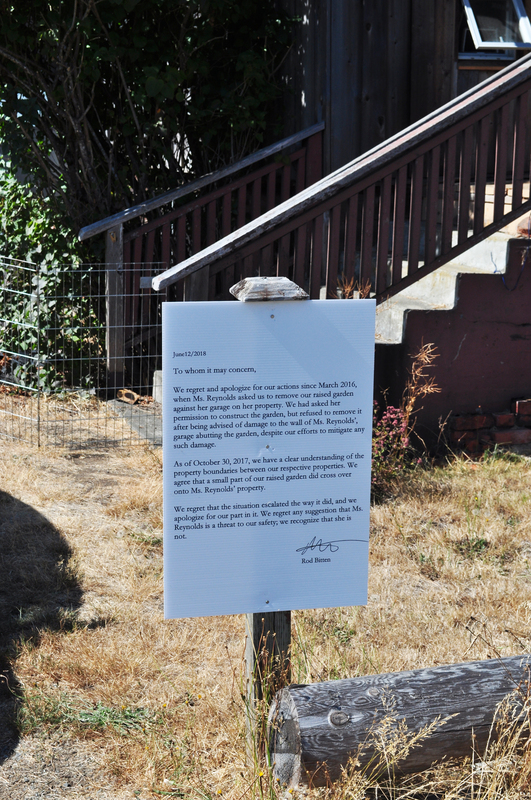 Hey, no one forced the Bittens to pay me money and to sign the apology – they wanted to settle. I was looking forward to Examinations for Discovery – transcripts would have been an eye opener! Seems they were so upset they even took the post. Not to worry – have another one and now that I know the quality, I have ordered more including a 24 x 36 one. Have heard the Bitten’s are claiming they won the court case. Just want to make sure the TRUTH gets out there. While we were negotiating they actually put a for sale by owner sign up – must have thought I wouldn’t care about the case if I thought they were moving. If you’re going to sell your house, you don’t just put a sign up in front of your house – you would at least put it on craigslist. Typical. This is what they thought we would agree to – dream on! 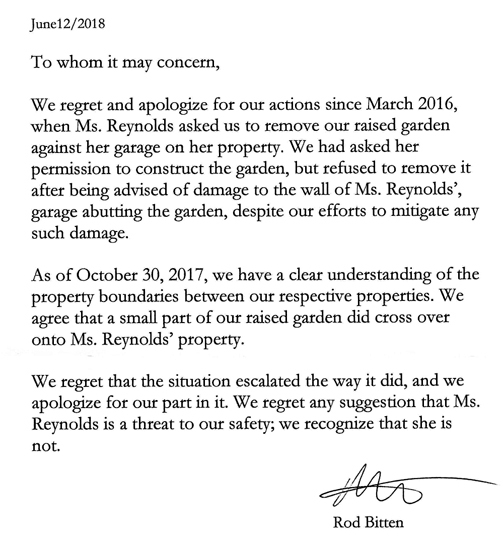 IT IS FURTHER UNDERSTOOD AND AGREED that Reynolds and the Bittens will at all times maintain the confidentiality of the terms of settlement of the Action, the Criminal Proceedings, the fact that money has been paid, and this Release, and will not divulge or publish, either directly or indirectly, in any manner whatsoever, the terms, details, facts of, or related discussions about the settlement of the Action, the Criminal Proceedings and this Release to any person, excepting immediate family members, for any reason whatsoever, except with respect to any obligation to disclose as may be required by law, or bona fide disclosure to legal, accounting or tax advisors, treating therapists, or treating physicians to which doctor/patient confidentiality would apply. Jason told them either they agree to the terms of the mutual release which did not prevent me from sharing the apology or there was no deal. Facing the consequences of being questioned under oath by Jason during Examinations for Discovery which could very well include admitting to lying to the police, they agreed to the terms. This is why they are so upset. They don’t want anyone to know what they did and the apology lays all that out. The money is secondary to the apology. It’s the apology that has value to me.